At first I was planning to stay in the Fragrant (香) Harbour (港) for half a year. It's been over one year now and for now, I'm staying. Let's look at some of the reasons why is it so. The city never sleeps. Neither did my next-door fruit market in Tai Wai, apparently. Whether I was going to work or going back home in late evening, I could always buy some oranges and durian :-S. A famous dim-sum restaurant was also usually open at 3am when I was going back from events in the city. Few people cook at home in Hong Kong – eating out is fast and cheap and also, who has time to cook when you only get out of work at 9pm. Getting together for a dinner is totally the standard way to meet friends after work, the equivalent of getting a beer in Europe. Dinners are altogether more social in Asia because the meals are shared – a group of people sits at a round table, orders dishes together and people take food from the centre of the table to their bowls. Thanks to this, you get to taste more different meals and also have something to talk about with your friends. You don't only share the meal but the enjoyment as well (or disappointment!) This way of dining is completely foreign to westerners but most of us get used to it pretty fast and enjoy it as well. Hong Kong is a big, lively city with 7 millions of people, all in an area of around 1000 km2. It's full of skyscrapers, tall apartment buildings, roads, rails, restaurants, shopping mallls, but, also rich with green hills, sea bays and islands! This is one of the differences with the sister city of Singapore (and not the only one). Some locals and many Czechs and Slovaks will wander into the hills and on the islands on the weekends in search of some tranquility and quiet. They'll rarely find it, because the city is constantly alive and noisy, but they'll get some healthy outdoor activity nonetheless. The hills are not very big, just below 1000 m but they offer a nice green escape from the concrete mass of downtown city. The image below illustrates two different approaches to urban planning. HK is the second case, it's very compact but the hilly areas are not very densely urbanized. 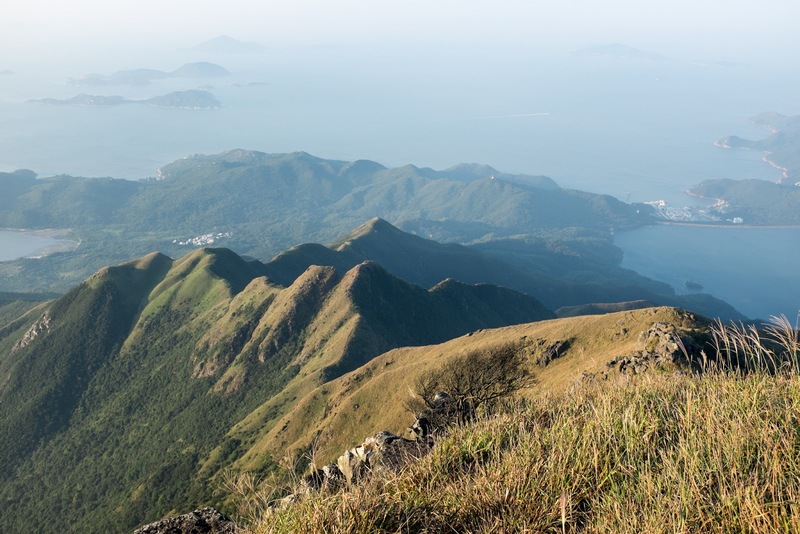 A large part of the special administrative region actually comprises of islands, from the large Lantau Island which offers a number of hiking trails to tiny islands in Sai Kung full of fishing villages. Some of them show off interesting rock formations as a part of the HK Geopark. Hiking may not be massively popular but junk boating certainly is. Well, human nature. Junk boat is all about renting a boat in the summer with a bunch of friends, buying some food and tons of drinks and sailing out to Sai Kung, the area full of small bays, beaches and islands which is not yet too spoiled. If you want to see most of SE Asia or China, living in here is a real boon. You can still have your modern civilization standard of life and at the same time enjoy fast and cheap connection to destinations which are very exotic for Europeans. A full-moon beach party in Thailand? Just take Friday off and have an extended weekend. Need to fix your back in hot springs in Taiwan? A weekend is enough (but Taiwan deserves a longer visit). Both of these for about 2000 HKD, return airfare. Additionally, if you work in HK, you'll be getting a HKID and that makes it much easier to get a visa for travelling to China. And this huge country has a lot of natural and cultural sights to offer too. To balance out, let's quickly mention the dark side. First, it's not very dark here at night. The main crossroad in TST is brighter than your dining room, so if you're an astronomer, you won't enjoy the stars a lot. And, light pollution is not the only type of pollution in HK. It's much better than China and I personally am not feeling any problems but some people do complain. Some of the foul air is imported from the neighbouring city of Shenzhen which is a Chinese industrial centre. Low visibility is also annoying but I blame it mostly on mist, not pollution. Me as a photographer curses it quite often because it spoils potentially awesome shots in many places. As you already noticed, I like the nature. Sadly, not all beaches and sea waters are nice and clean. With this amount of boat traffic and people in the area, it's almost impossible to keep them pretty. But at the current rate of (ab)using the environment in HK, it will turn pretty disgusting sooner or later.